The icon of Our Mother of Perpetual Help is one of the most well-known and loved images of the Blessed Virgin known to Catholics. For many years, a weekly holy hour or novena in honor of Our Mother of Perpetual Help was common in many parish churches all over the world, and indeed, the custom continues in many places to this day. The history of the original icon, which is now enshrined in the Redemptorist Church of Saint Alphonsus in Rome, can be traced back to the year 1495, when the image, already considered ancient, was enshrined in a church on the island of Crete. When the island was threatened by Turks, the icon was carried off — possibly stolen — by a merchant who took it with him to Rome. Shortly after arriving there, the man became grievously ill. Before his death he begged a friend to take the icon to one of the churches in Rome so that it could be publicly venerated. Upon his death; however, the friend’s wife persuaded her husband to allow her to keep the painting in their home, where it remained for several months. One night the Blessed Virgin appeared to the man in a dream, warning him not to keep the picture. Twice she appeared to him with this message, and both times he disregarded her warning. The third time she told him that if he continued to disobey her, he would die a miserable death. This time the man tried to persuade his wife to give up the painting, but she refused. Our Lady appeared to the man again to tell him of his impending death; within a short time, he became sick and died. Our Lady then appeared to the man’s 6-year-old daughter, telling her to tell her mother, “Holy Mother of Perpetual Help commands you to take her out of your house!” The mother, who had seen a similar vision, was terrified and was about to give the picture to a church when a neighbor woman persuaded her that it was just a dream and that she should pay no attention to it. That night the neighbor became violently ill, and recognizing her fault, made a solemn promise to the Lady of the picture, whereupon she was immediately cured. Again the Blessed Virgin appeared to the young girl, this time commanding her to tell her mother to place her picture in a certain church between Saint Mary Major’s and Saint John Lateran’s. That very day, March 27, 1499, the picture was taken in solemn procession to the church of Saint Matthew the Apostle, where it was placed above the exquisite white-marble altar. The church itself was very small — only about 75 feet long and 35 feet wide. Nevertheless, the shower of miraculous graces began even before the image entered its walls, with a paralyzed man being cured as the procession passed by his house. The history of the image up to this point was written in both Latin and Italian on a large piece of parchment, which for many years was hung next to the icon in Saint Matthew’s Church. Copies of the parchment are now kept in the Vatican Library. For the next three hundred years, this humble church was one of the most popular pilgrimage places in Rome because of the miraculous picture. Then in 1798, the Church of Saint Matthew was levelled to the ground by Napoleon’s forces. The Augustinian monks who were caretakers of the church took the picture with them, but for 64 years it was lost to the rest of the world. Eventually even the monks forgot that the image had once been regarded as miraculous. And he did remember, even well after he entered the Redemptorists in 1855. As a young priest Father Marchi lived at the generalate of the order, which, along with the Church of Saint Alphonsus, was built on the same piece of land on which the Church of Saint Matthew once stood. One day while the community was at recreation, he had the opportunity of sharing this recollection from his youth with his fellow religious. One of the priests mentioned that he had learned that a miraculous image of the Blessed Virgin had once been venerated in the Church of Saint Matthew which once stood there, but that it had been lost many years earlier. At this Father Marchi broke in, “But it is not lost! I know that picture — it is called Our Mother of Perpetual Help. I saw it often during the years of 1850 and 1851 when I was a young student. It is in the chapel of the Augustinian monastery of Santa Maria in Posterula.” Father went on to explain what Brother Augustine had often told him about the image and its origin. The Redemptorists now knew where the miraculous picture could be found, but they did not know about Our Lady’s command. The time had not come for the icon to come out of obscurity. It was several years later, because of a sermon given by a Jesuit priest in one of the churches of Rome, that the icon was finally returned to the place where Our Lady wished it to be honored. On February 7, 1863, Father Francis Blosi gave a sermon about several of the famous pictures enshrined in the churches of Rome. Among them he described the miraculous painting of Our Lady of Perpetual Help that was once enshrined in the Church of Saint Matthew. He appealed to his listeners that anyone there who might know its whereabouts should remind its possessor that the Blessed Virgin had commanded that it be honored between the Basilicas of Saint Mary Major and Saint John Lateran. When the Redemptorists heard this, they went to their superior general, Father Nicolas Mauron, begging him to procure the picture from the Augustinians for their church, which stood on the site of the old Church of Saint Matthew. The Cardinal prefect will call the Superior of the little community of Santa Maria in Posterula and will tell him it is Our will that the Image of the most holy Mary, of which this petition treats, be returned between Saint John’s and Saint Mary Major’s. However, the Superior of the Congregation of the Most Holy Redeemer is obliged to substitute another suitable picture. The Augustinians were stunned to see the note from the Holy Father, for they had no idea that what a treasure they had had in their possession. Although they were sad to see the picture leave their monastery, they rejoiced to see it returned to the place where the Blessed Virgin desired it to be honored. In place of the original picture, they were given an exact replica within a short time. The Redemptorists were thrilled to receive the miraculous image, but wishing to give it a fitting welcome, delayed its installation in the church until it could be cleaned and repaired, and other suitable preparations could be made. Finally, on April 26, 1866, the solemn procession and the formal enthronement of the icon took place. Along the procession route the buildings and the roadsides were decorated with flowers, vines and banners. Once again Our Lady showed her pleasure at the love shown her by her children by an outpouring of grace, for several miraculous cures took place that day. When the procession returned to the church, the icon was enshrined over the main altar amid much rejoicing. For three days the celebration continued, with beautiful High Masses, Benediction, special devotions and sermons each day. As the word of the miracles spread, people came by the hundreds to see the picture and honor the Blessed Virgin. Soon the whole front of the church was filled with abandoned crutches and canes and other ex votos, tokens left in thanksgiving for cures. Not even two weeks had passed when Pope Pius IX himself came and spent many long moments praying before the image. “How beautiful she is!” he said, after gazing at the picture. Later, when the Archconfraternity of Our Lady of Perpetual Help was formed, the Pope insisted that his would be the first name on the list of members. On May 12, 1867, the Vatican ordered that the icon should be crowned. On June 23 of that year, after a Solemn High Mass, amid joyful hymns, two golden, jewel-encrusted crowns were blessed, with one crown being placed on the head of the Blessed Virgin and the other on the head of the Infant Jesus. The icon’s popularity among Eastern Rite Catholics was emphasized by the presence of the Latin Patriarch of Constantinople, who presided at the ceremony. 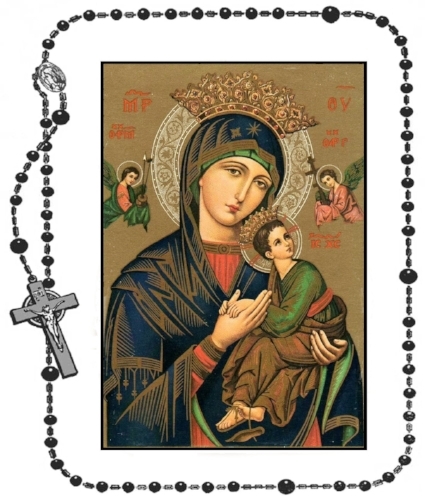 Devotion to Our Mother of Perpetual Help spread quickly to the United States. When the Redemptorists established a mission church near Boston, they dedicated it to Our Lady under this title and were privileged to receive from Rome the first copy of the icon which had been touched to the original and blessed. On Pentecost Sunday, May 28, 1871, the icon was carried in a magnificent procession to the church, where it was enshrined above the main altar. As with the original image in Rome, no sooner had the painting been displayed for public veneration than the miracles began. Soon the small wooden church was thronged with so many devotees of Our Mother of Perpetual Help that it soon became necessary to begin construction of a new, larger church. Even the large beautiful new church which was dedicated in 1878 could not hold the thousands who flocked to the miraculous image in those early years — and rightly so! Between the years of 1871 and 1884, according to Father John Byrne, C.SS.R., “no less than 331 well-authenticated cures had been reported, some of which had been wrought in favor of people living so far away as West Virginia and Texas.” In 1886 alone, from January 1 to May 31, he continues, “thirty-one cures, apparently beyond the power of nature to effect, were reported.” A few years later, seven cures were reported to have taken place on a single day, the Feast of the Immaculate Conception, December 8, 1891. The weekly devotions in honor of Our Mother of Perpetual Help is a custom that was introduced in 1922 at Saint Alphonsus Church in Saint Louis, Missouri, which at one point drew as many as eighteen thousand people every week. The devotion spread quickly from church to church until eventually, in Saint Louis as in New Orleans, Detroit, Chicago, and Boston, it became necessary to schedule eight to ten services a day to accommodate all the people who wanted to honor Our Lady under this title. Before long the custom of weekly devotions in honor of Our Mother of Perpetual Help had spread worldwide. The icon of Our Mother of Perpetual Help is an example of the western influence on eastern art, especially in the 12th and 13th centuries, as Franciscans traveled through the eastern Mediterranean, this influence became evident in a new class of icons called Cardiotissa, from the Greek word kardia, which means heart. Cardiotissa, then, refers to a type of icon which shows tenderness, compassion, and mercy. Our Lady’s face, though serene and dignified, shows great sorrow in contemplating the sufferings of her Son. Still, for those who are accustomed to western art, it isn’t always easy to appreciate the beauty of an icon without understanding more about this form of art. To a Catholic of an Eastern rite, an icon is not simply an artistic representation. Once it is blessed, it becomes a window to heaven, a point of contact, “so that in praying before it, one is in the spiritual presence of the person represented. Reverently kissing the icon, one kisses the personage; bowing before it, one bows before the personage” (Robert Lane, “Russia and the Icon,” The Reign of Mary 117, p. 5). An artist about to paint an icon prepares himself spiritually by prayer, confession, Holy Communion and sometimes fasting. He prays even while painting, for he sees himself as an instrument of the Holy Ghost, the principal artist, who will use the icon as an instrument to channel graces to those who reverence it and pray before it. In most cases, the artist does not even sign his name to his work. In western art, there is little difference in the styles used in sacred art as compared to secular art; only the subject matter is different. Icons, however, are not meant to be realistic as far as physical representations, but rather to portray eternal truths in a way that immediately transports the viewer to a spiritual plane. Perhaps the simplest way to describe it is as “theology in line and color.” The images are rendered in an extremely stylized, non-naturalistic way. The folds of garments appear as simple geometric forms, while faces and bodies show portray human nature transformed by grace into the divine. Why is the Child Jesus so frightened? The angels in the picture are holding instruments of His Passion and death, with the angel on the left bearing the gall, the lance and the reed, while the angel on the right holds the cross and nails. Their hands are covered with a cloth or veil, much like the humeral veil that the priest holds when blessing with the Blessed Sacrament in the monstrance at Benediction. The face of Our Lady is grave and sorrowful, with her large eyes directed not at Jesus, but at us. One feels that she is pleading with us to avoid sin, which has caused her Son to suffer so much for us. Her gaze makes us a part of the picture and the pain it portrays. “Will you not love my Son, Who has loved you so much?” she seems to say. The Greek initials next to the head of Our Lady identify her as “Mother of God,” while those next to the Child are the abbreviation for “Jesus Christ.” The letters over the angels’ heads indicate the one on the left as Saint Michael and the one on the right as Saint Gabriel. The 8-pointed star on Our Lady’s veil tells us that she is the Star of the Sea, the Star that leads us to Jesus. The small ornate cross to the left of the star reinforces this concept. Mary’s mouth is small to indicate her spirit of silence and prayer. Her eyes are large, for they see all of our troubles and needs, and are always turned toward us. Christ’s hands, turned palms down into His Mother’s, indicate that He has placed the graces of the Redemption in her keeping. Our Lady’s hand does not clasp those of her Son, but remains open, inviting us to put our hands in hers along with those of Jesus. As in other icons, the background of the painting is gold to symbolize Heaven, where Jesus and Mary now reign in glory. This light of Heaven shines through their clothing, illuminating not only the picture itself, but those who behold it. This radiance speaks to us of God’s light and grace, strengthening and consoling us as we journey through life to our heavenly goal. Finally, it is of no small significance that Our Blessed Mother herself referred to the icon by the title of “Holy Mary of Perpetual Help.” Surely this, along with the symbolism we see in the picture, should assure us of the loving concern and tenderness our Blessed Mother has for us, and her ardent desire to be a source of perpetual help to all who call upon her.